[156 Pages Report] Industrial Nitrogen Market was valued at USD 15.03 Billion in 2017 and is expected to reach USD 19.96 Billion by 2022. The market is projected to grow at a CAGR of 5.83% during the forecast period. The base year considered for the study is 2016, and the market size is projected from 2017 to 2022. The report aims at estimating the size and future growth potential of the industrial nitrogen market across different segments form, transportation & distribution, technology, end-use industry, and region. It also provides detailed information regarding the main factors influencing the growth of the market (drivers, restraints, opportunities, and industry-specific challenges). It aims to study the individual growth trends, prospects, and contribution of the various segments to the total market. The study also analyzes the opportunities in the market for stakeholders and details of the competitive landscape of market leaders. It also strategically profiles the key players and comprehensively analyzes their core competencies. The market ecosystem includes various stakeholders involved in the supply chain of the industrial nitrogen industry starting from raw material suppliers, research & development, and manufacturing. Post this, the marketing and sales of the products take place, which is only possible if an efficient distribution channel is developed. Finally, the end products are made available to the consumers. The global market for industrial nitrogen is dominated by players such as Praxair (US), Air Products and Chemicals (US), Air Liquide (France), Linde (Germany), and Taiyo Nippon Sanso (Japan). Other players in this market include Messer Group (Germany), Nexair LLC (US), and Gulf Cryo (Kuwait). 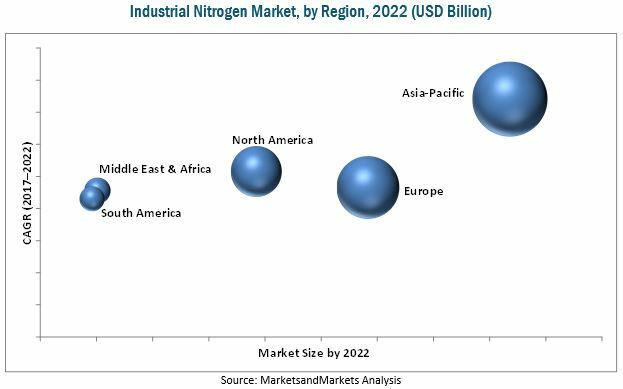 MarketsandMarkets projects that the industrial nitrogen market will grow from USD 15.03 Billion in 2017 to USD 19.96 Billion by 2022, at a CAGR of 5.83%. This market is witnessing considerable growth due to the growing food & beverage and pharmaceutical industries in the emerging Asia Pacific market. Technological advancements in industrial gas are the key factors driving the growth of the industrial nitrogen market. The industrial nitrogen market, by form, is segmented into compressed gas and liquid nitrogen. The compressed gas segment accounted for the largest share in 2016. The dominant position of this segment is owing to the fact that nitrogen gas finds wide application in a large number of industries as it is used to store petroleum liquefied explosive and flammable materials since it is an active element. As nitrogen is an inert gas, it is also used in the manufacturing of stainless steel. 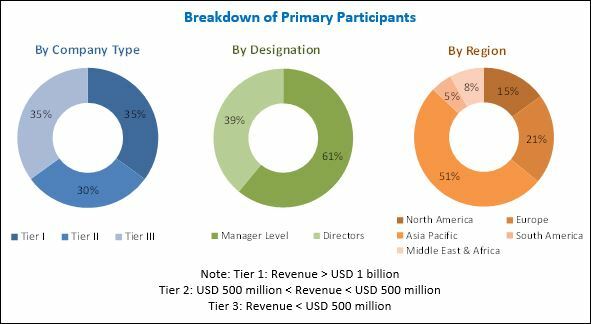 The industrial liquid nitrogen market, by end-use industry, is segmented into food & beverages, pharmaceuticals & healthcare, electronics, metal manufacturing & fabrication, chemical, oil & gas, petrochemical, and others (construction, automotive, R&D, rubber, and plastic). The food & beverage segment accounted for the largest market share in 2017. Industrial nitrogen creates a dry atmosphere, so foodstuffs do not perish due to moisture. It is also used to maintain freshness and increase the shelf life of products, which helps in the packaging and storage of food & beverages is driving the demand for industrial nitrogen in this sector. In 2016, Asia Pacific accounted for the largest share of the global industrial nitrogen market and is projected to grow at the highest rate during the forecast period. The increase in the demand for industrial nitrogen can largely be attributed to the rising population of the region with high disposable incomes and growing industrialization in the region. However, factors such structural and regulatory restrictions are restraining the growth of the industrial nitrogen market. The global industrial nitrogen market is dominated by players such Praxair (US), Air Products and Chemicals (US), Air Liquide (France), Linde (Germany), and Taiyo Nippon Sanso (Japan). Other players in this market include Messer Group (Germany), Nexair LLC (US), and Gulf Cryo (Kuwait). These players adopted various strategies such as expansions & investments, joint ventures & agreements, contracts, new product launches, and mergers & acquisitions to increase their share in the industrial nitrogen market.